Update your bedroom with this beautiful upholstered bed with nailhead trim for a distinctive look. The foam padding on the headboard of this bed makes it a comfortable spot to lean back with a book or laptop. Was delivered in small box. Nice color and nice quality. Dose not come with spring box. Need high mattress. This is a gorgeous bed and was fairly easy to put together. The instructions did not arrive with the item and Overstock Customer Service was not helpful at all. So, using my Ikea brain, I put it together myself. It took about 1.5 hours trying to figure out the pieces; thankfully it was intuitive. I will have to go purchase more slats however as the slats provided are not sufficient to hold up a king memory foam bed. All in all, satisfied. Ordered this bed for my granddaughter and it arrived quickly and was packaged nicely... the bed was very easy to assemble and came with everything I needed . 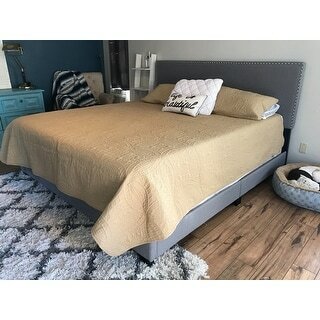 The bed can be assembled with one person and took no time at all... looks super nice and the color is true to its picture and looks expensive for the amount I payed so was a very good deal. Great purchase. Comes in one box, very easy to assemble; took maybe 30 minutes start to finish. It looks great. We’ve decided to add a box spring to lift the bed up higher because it does sit very low. This bed frame was a terrific price and was fairly simple to put together. I'm happy with the nice upholstered look. The only negative is that the bed frame sits flush to the floor eliminatong any underbed storage which I do rather wish I still had. This bed is plain, but looks great! Assembly was pretty easy but took some time. It's tricky laying out the boards to screw in, because they're all attached together by ribbons. When all was said and done I was missing one screw, but it's probably around here somewhere...all blends into the carpet! Happy with this bed!! For the price was awesome. Very easy assembly, all parts were there. Perfect or a guest bedroom. Would highly recommend l! I love the look of the bed. It was easy to put together. It is currently holding a box spring and 12 inch heavy foam mattress. I would have liked more slats for the frame but they can be easily added. I’m very happy with this purchase. The shipping was quick and convenient. I was shocked to see how slim the box was upon arrival, in-fact I was rather worried because I couldn’t comprehend how a full size bed with a headboard and footboard could possibly all fit in this thin box. I loved the concept from the moment I opened it. When you open the box it looks like it’s just the headboard but all the components are stored inside the back of the headboard. My husband and I put this together in just over an hour. Very easy assembly, just make you sure tighten the screws a few times in order to get a steady alignment. I’m shocked how much I love this bed, I most likely will order my daughter one too. I ordered this bed for my 17 year old son. The bed was easy to assemble, he was able to put it together him self. He loves this bed. I would definitely purchase this bed again. Looked and looked for a bed. This is was having guest when it arrived. Perfect. Putting together was easy enough. Delivery great. Right on time. Packaging was brilliant, and I love how easy it was to put together. Looks fabulous! I LOVE it so much, beautiful, easy to put together, made like it was a thousand dollar set. I give it 10 stars, for the price, and how great it's made a no brainer. I bought this for a spare bedroom. Great quality and extremely easy to put together. I put it together myself and it took less than 45 minutes. Sturdy and looks great in the room. Absolutely love this bed! It is perfect for a farmhouse theme. Setup was a breeze. Like other reviews, I would recommend additional slates for support. I have my mattress on boxsprings and bed feels secure and well built. The studs are beautiful and exactly what I wanted. Highly recommend! "What is the best size ( depth) of mattress and box springs to work with this bed. I just received the full size for my sons room and do not want to make a mistake on buying new mattress"
"can this bed be used without a box spring - can additional slats be added"
"What is the gross shipping weight of the King?" The shipping weight for the King is 68 pounds. "On the details under the Olivia Grey Linen Upholstered bed it states color is brown -- under spec states Grey. Just wondering why brown is mentioned?? Item 23403179"
We apologize for the confusion- the bed is gray. "What are the sizes of the package when arrive? Would it fit into the trunk of a suv?" The carton size of the King bed is 81"L x 28"W x 3.5" H.
The price, the color, and extra rewards that were offered with my order. "How many slats are there?" The queen,full and twin bed comes with 4 slats and 4 support legs and the king bed comes with 4 slats and 8 support legs.